The set hammer is one of the easiest tools made. Take a piece of tool steel 1 1/2 square inches. Punch the hole as when making chisels. Place the set hammer over the bottom fuller cornerwise, the top fuller on the upper edge. Have the helper strike a blow or two, and the grooves, thus made will make the set hammer look nobby also. See Fig. 26. When the hammer is ready, harden and draw temper to a coffee color. For bottom swages, use tool steel 2 inches square. Place the steel over the fuller, and fuller down to the size of the square hole in anvil. Draw out that shank to go in the hole first. Next cut off steel, heat, and place.in the hole in anvil, and draw out. The rest suggests itself. When ready to groove, place a piece of iron the size wanted over the part to be grooved, and strike with sledge. You may place the flatter on top of the rod to hold it steady. Top fullers are made much the same way,—the hole to be made when the rest is finished, contrary to the rules for hammers, etc. 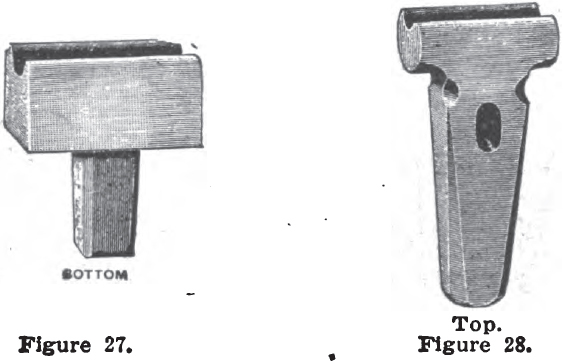 Fullers are made the same way as swages. See Figs. 29 and 30. 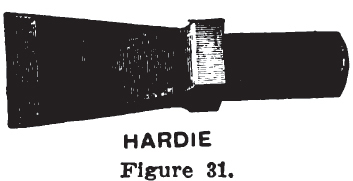 Hardies are made on the same principle as bottom fullers. They must be made of good steel, and hardened. Draw the temper until it turns from coffee to a blue hue color. See Fig. 31. Punches should be made of the best tool steel. Use 1/4 or 1/2 inch square material. Punch the eye first; then make a groove under the eye with the fuller; next draw point. These tools are easily made. Do not harden. See Fig. 32. For bolt making, a heading tool must be used. 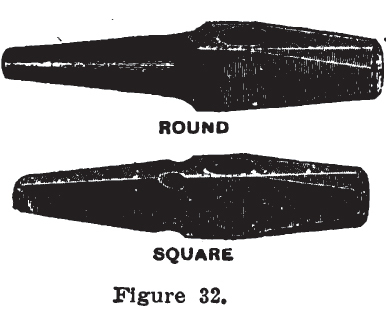 To make one, take tool steel 2 inches square, fuller off the head, and draw out shank, as shown in A, Fig. 33. 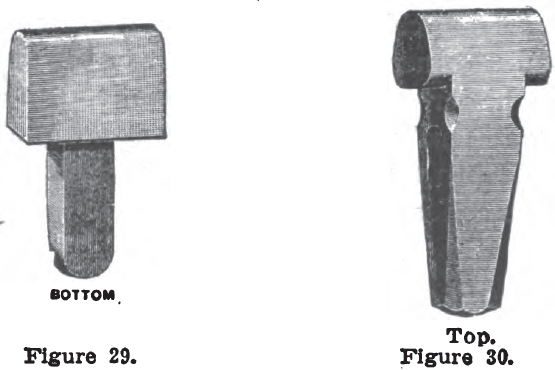 Another yet handier head tool for a repair shop is shown in B, Fig. 33. This tool can easily be made from 1×2 inch tool steel. Drill the holes for the different sizes, and countersink one side for countersunk heads as for plow bolts, etc Do not harden.